This week we thought we would share some Old Gold from the series “The 7 Pillars Of Wisdom” from 3 years ago. 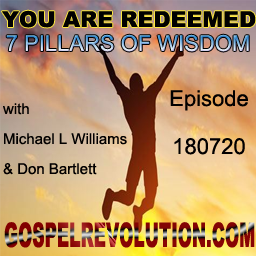 In it, Mike Williams and Don (Beres) Bartlett discuss the first of the Seven Pillars of Wisdom: The Doctrine of Redemption. In this Powercast, we get an in-depth view of redemption as well as salvation and why it is such an important part of wisdom.